Welcome to my Portfolio. I’ve divided the many different projects and events into categories. There have been many exciting new happenings. ARTICLES features my “Beadwork” projects, while IN THE PRESS includes publications which reprinted some of my projects as well as articles about my classes, presentations. 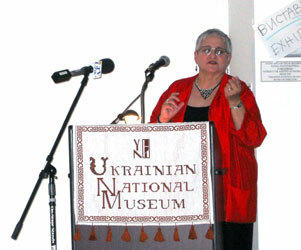 In PRESENTATIONS, see information about my shows about Beadwork in Ukraine. One is from a historical perspective and the other contemporary. See the title slide, description and list of show presentations. MEDIA includes DVDs of my appearances, archived TV episodes, and links to YouTube videos. SENYK “WHITE ASTER” features a very special project for promoting the poetry and embroidery of Iryna Senyk (1925-2009). I was the designer of 27 embroidered fashion outfits from her sketches; designer and editor of the deluxe bilingual book of poetry and fashion sketches; producer of a multimedia Première to launch Iryna Senyk’s White Aster of Love in 1992 and repackaged the presentation for subsequent road trips to promote it. I’ve summarized this project in a “Photo Album” Powerpoint. Comments by each image give the essential details. True to my motto, “A picture is worth a 1,000 words,” my portfolio is easy to peruse.